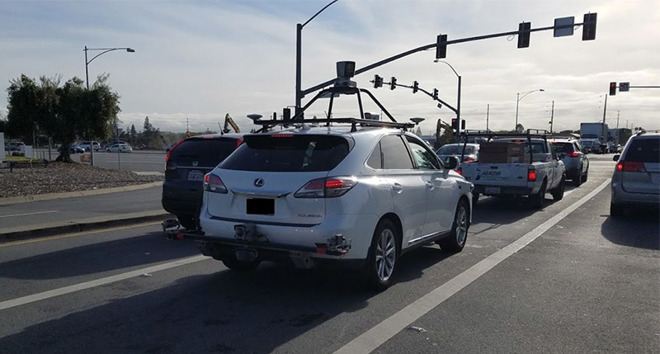 An older version of Apple's self-driving test bed. Most of the impacted workers are engineers, according to a filing with the California Employment Development Department seen by the San Francisco Chronicle and subsequently verified by Apple spokesman Tom Neumayr. That includes 38 engineering program managers, 33 hardware engineers, 31 product design engineers, and 22 software engineers. The layoffs will take effect on Apr. 16, and are said to affect eight office and industrial properties first uncovered by AppleInsider in 2015: 3000 Kifer Road, 3689 Kifer Road, 5301 Patrick Henry Drive, 2945 San Ysidro Way, and 2975 San Ysidro Way in Santa Clara, and 1150 Kifer Road, 1170 Kifer Road and 195 N. Wolfe Road in Sunnyvale. The two towns are connected and not far from Apple Park in Cupertino. Over 200 people were dismissed in January this year. At least some of those people were moved to other parts of Apple -- it's not clear if the same triage is being repeated. Even less certain is what the layoffs could mean for Project Titan. While the company has been testing on California roads, its ultimate goals for the initiative are nebulous. While it could be developing a full-fledged vehicle, Apple might also be working on a platform for third parties. Most recently a German report claimed that Apple might be designing an electric van rather than a sedan or compact. In any case, nothing is expected to go on sale until at least 2023. I guess that will save about $30million/yr in salaries. Hire some more people to the Siri team to finally catch up with Amazon/Google. From reading the source article from the SF Chronicle, it seems this is the same layoff we heard about last month, only now officially submitted to the state. This AI article makes it sound like it's an additional set of layoffs. "The layoffs were disclosed, along with new details, in a letter this month to the California Employment Development Department. CNBC reported last month that layoffs were occurring in the self-driving car division, known as Project Titan. Tom Neumayr, an Apple spokesman, confirmed that the letter to the state referenced the same layoffs." Project Titan was a “me too” project. If Apple was one of the top companies in self driving, that would be different. But with companies like GM (automakers) doing so much better (than Apple) it’s kind of a waste of resources. You're so wrong it's disgusting. Apple has been working on this before the self-driving bandwagon. Far from "me too". Also you and neither of us here can say who's doing better than Apple when we have no idea what they've done or what they're doing. Apple could have released a crappy car 3 years ago as a "me too" project but it's far from that and Apple only releases polished products. That Project Titan is just “a hobby”? Yep. And something that was a gleam in Jobs’s eyes that his successors have not been able to implement well. Last time I checked 871.65 vs. 0.09 disengagements per 1,000 miles is really really terrible. Now... we can probably make up some excuses, but the fact Project Titan is under new management, and the fact this isn’t the first time hundreds of employees have been layer off. I think anyone can do the math on how the project is going. As for the project being “me too”.. Pretty much everyone (including Qualcomm) is working self-driving cars. Raise your hand if you want to be a passenger in a self-driving car in the snow or heavy rain. I think the answer is “hell no!” for at least another decade. Apple can do consider innovation in the auto space, but they’re burning cash for no reason (with self driving cars). That’s my conclusion, at it looks like that’s the conclusion on management. By the way, nobody still thinks Apple is still working on building a “car”. There’s no evidence that was ever their goal... they’re using Lexus’s in their testing. 38 managers? That is at least 33 too many. I'm sure that a lot of it was redundant. I like cutting the fat. There has been considerable evidence that Apple plans include an actual car. They hired quite a few people specifically from the car manufacturing industry who were in manufacturing. That at doesn’t mean Apple was / is planning to manufacture a car. We don’t know. But there has been evidence. As for Apple’s abilities in this space, no one outside of Apple knows where they’re at. To state they are not capable, others are better or worse, or not working on something is folly. No different than that claim so many years ago about their ability to design and sell a phone. When we don’t know something, it comes across as ridiculous to state otherwise with total confidence. Apple probably thought “we’re a software company, we can do this better”. The problem is auto companies have a lot more experience with the problems facing drivers, like road conditions, legislation, etc. Google also had a 5-6 year head start on Apple. Google has extensive experience with AI and “big data” so they had an advantage over everyone. Remember how terrible Siri was? That’s the same kind of thing. It’s taken a lot of time and resources at Apple to make it decent. We don’t really know what Apple’s “end game” is with Project Titan. Going from car count, GM is allocating considerately more resources. They have something like 4x more vehicles on the road... so, to some extent Apple’s efforts are comparably “a hobby”. I think Project Titan will put self-driving cars on the back burner, but keep an autos focus. I think AR while driving is intriguing, and could be more immediately useful. I think Apple wants drivers using CarPlay + Maps (revenue stream), and AR providers better synergy to what GM (for example) is doing. Another moron who calls you a "fanboy" when presented with facts. NONE of what you posted disproves what I said. Well we do know Apple is the only company Tesla feared. All that trash talk reminded me of IBM/Blackberry/Pebble. It was the first sign Apple was working on something huge. I don't think Apple will pump billions into something and working since 2009(earliest WE know) only to toss it away. I don't have any insider sources on this or anything, but this seems to me like the perfectly-ordinary end of one of the projects within the larger scope of the entire effort. While it certainly could mark a change in direction or a failed experiment within Titan, it could also simply be the "we've finished the prototype of what we plan to do" stage, and thus trimming the team that was responsible for that portion of things. To put this another way: the number of engineers working on Apple TV these days isn't the same number that worked on it during its first three iterations. Hilarious. Warren Buffet has spoken and Cook is finally wising up to shut down the black hole called Titan. Money goes in nothing comes out. Wait... if they lay everybody off, who's going to take over to drive the car when the autopilot shuts off? There's very little hard data on project Titan, but I think it's safe to say that self driving cars are not something you can 'dabble' in. You either need to be prepared to make a major commitment or stay out of the game. This report makes it look like Apple has decided to get out of the game. That's fine by me - a self driving car by Apple would have been cool, but it's really not their forte, and I don't think the company is any worse off not having one. These layoffs don't mean the end of project Titan. Far from it actually. If you go back last year and see the criminal complaint filed against the Chinese national busted for stealing project Titan secrets, it showed almost 5,000 Apple employees are involved with the project.